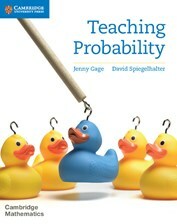 The material on this site supports Teaching Probabiity, published by Cambridge University Press in the Cambridge Mathematics series. For comments and queries, please contact educs@cambridge.org . Some worksheets are provided here in colour and greyscale versions, in Word and pdf formats. You can adapt them for your own class. Chapter 5: Which team will win? Chapter 20: What's the best strategy? Chapter 21: What does 'random' look like? Chapter 23: How probable is probable? Chapter 25: Heads or Tails, boy or girl? Spreadsheet: Lotteries, chances of getting jackpot and other numbers right. Spreadsheet: lottery analogies: flipping coins, throwing dice, grains of rice. Chapter 31: Happy birthday to you, and you, and .. Spreadsheet: birthday matches in group. Chapter 32: How long do I have to wait? Chapter 33: Do you know what you don’t know?